It seems like there is a never-ending appetite for true crime stories. From the “Escape at Dannemora” miniseries to the documentary, “Wild Wild Country,” your true crime fix is right at the press of the button from the comforts of your own couch … and a few $10-12 monthly fees. The latest water cooler talk craze is Netflix’s “Ted Bundy: Conversations with a Killer.” There are plenty of documentaries or books that you can check out if you need that deep dive into the life and times of who may be the worst serial killer in United States history, but what makes this unique is it uses actual recordings of Bundy while he was incarcerated in a Florida prison. 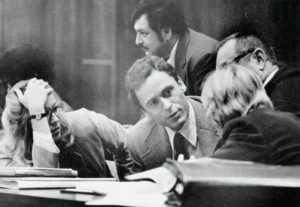 More creepy than fascinating, “Conversations with a Killer” gets repetitive and may actually give Bundy, a narcissist of the highest order, the attention he had always wanted. The good news is that the entire series consists of four one-hour long episodes. All of them move back and forth in time with the clever use of graphics that look like cassette tape. The bad news is that each episode gets repetitive and slightly boring. The series is essentially a film version of a book with the same title and the authors of that book, Stephen Michaud and Huge Aynesworth, are heavily featured. Their sit downs with Bundy provide the bulk of the audio and each of them fill in the blanks. Each segment follows the same formula: authorities and reporters talk about a Bundy murder, news footage is shown, Bundy tapes are played then the two writers talk about it. Wash, rinse, repeat. It’s not that the sordid and disgusting events aren’t interesting, but the way the material is presented is fairly boring. There’s also very little attention paid to Bundy’s victims or their families, which is downright disturbing. It would be impossible to devote even the smallest amount of time to each deceased woman. In fact, even if five minutes were spent on each of his almost 40 victims, you’d be looking at more than three hours of film. Even though they deserve to be remembered, that’s a pretty lengthy and depressing sit. If this four-hour documentary isn’t enough to keep you fully depressed and engulfed in human depravity, don’t sweat it. This is just a history lesson to prepare you for “Extremely Wicked, Shockingly Evil, and Vile”, the full-length feature film starring Zac Efron as Bundy. It’s directed by the same man, Joe Berlinger, who brings you this documentary and he is either highly disturbed or just a guy with a lot of historical knowledge. Either way, he’s a marketing genius. Berlinger doesn’t have a lot of video footage to run with so he uses stock footage of hippies, cute girls at lake parties, and loads of shots of newsroom folks smoking while looking extremely serious. He also seems hellbent on letting us all know how attractive and smart that Bundy was, which is bizarre because, well, he’s not good looking in any way, shape or form. The fourth episode is easily the best of them all and shows just how insane Bundy was. Actually, everything about the entire scene was crazy, from him defending himself in a courtroom to the crazed scene outside the prison as Bundy was executed. If anyone deserved capital punishment, it’s this guy, but it should hardly be celebrated in the manner that it was. If historical crime is your bag, then “Conversations with a Killer” is right in your wheelhouse. If not, it’s going to be an odd bore starring a major sicko. If you think you lean towards the latter, then it may be best to hold off and see if Zac Efron can pull off the move from “High School Musical” to deranged serial killer. Now that will be interesting.